Considered a freshwater system, Miacomet Pond is around 1.5 miles long and juts from the ocean beach and dunes separating it from the sea at around 400 wide northward between partially developed conservation land on either side of its southern end into a dense residential zone on three sides (north, east and west) where the pond narrows to around 10 feet. Access Miacomet Pond on its east side by Miacomet Road and to the west, via Miacomet Avenue and West Miacomet Road. The town had opened this pond in the past, but within the last 25 years, only to drain excess water out of it because of high ground water levels flooding nearby basements. 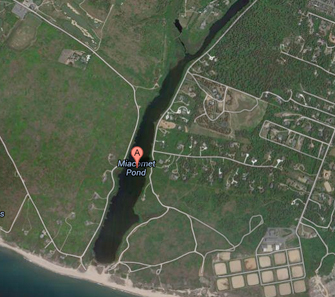 Because Miacomet Pond evolved into a fresh water body over time, biannual saltwater influxes spell death and destruction for this pond rather aiding its impaired status, so the town no longer opens it to the ocean. As with the other outwash ponds along Nantucket’s southern shoreline, the same varieties of fish live in this pond as do snapping and painted turtles, inland ducks, sea ducks, swans and wading birds populate Miacomet Pond depending on the season.